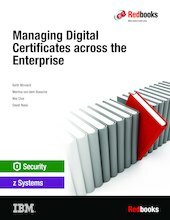 This IBM® Redbooks® publication is the first in a series of five books that relate to the implementation and management of digital certificates that are based on a public key infrastructure. Digital certificates play a major role in the protection of data communications and their use continues to grow. - Chapter 1, “Digital certificates overview” on page 1 provides an overview of digital certificates. It describes their purpose, gives a high-level overview of how they are created and their relationship to keys and encryption, and how they can be deployed into an organization. - Chapter 2, “Digital certificate management considerations” on page 19 describes choices and their possible effects to consider for setting up and organizing the infrastructure and processes to be effective in your environments. - Chapter 3, “Introducing z/OS PKI Services” on page 27 describes how the IBM z/OS® PKI services can provide you with a cross-platform solution to manage your digital certificates and build a strong solution that uses established qualities of service. Your comments are appreciated. Your feedback can help improve the quality of our Redbooks publications so other readers can gain more value from them.